This lovely full-size Beckman Pianola was manufactured in Chicago USA in 1926. It features a French polished American Walnut cabinet in beautiful condition and comes with a matching pianola roll cabinet and piano bench with reupholstered lift-top lid. 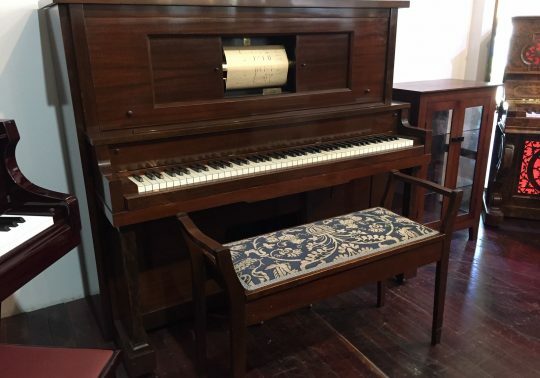 A full-size family model, this lovely pianola includes a full iron frame, overstrung design and underdamper mechanism. Both the cabinet and original keyboard are in beautiful condition and the pianola mechanism is in good working order. This Pianola came to us from a farmhouse on the Yorke Peninsula and we have restored it to its former glory. It plays perfectly both as a piano and pianola, providing hours of fun for the family. Pricing includes professional, fully insured delivery, matching piano bench and a full 15- year warranty. Also included is our premium care package including on-delivery inspection and free first tuning within 2 months after delivery. Country and interstate delivery easily arranged through our nationwide Removalist.